On October 31, 2017, the home town Dodgers unsuccessfully challenged Astros baserunner Josh Reddick's slide at second base, putting a confirmed cap on Replay Review for the year. Crew Chief Gerry Davis signals an out. 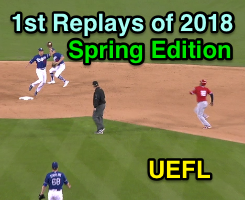 On Monday, instant replay picked up right where it left off, with a Dodger Stadium review, this time from Angels Manager Mike Scioscia of 2B Umpire Gerry Davis' "no catch" call on a diving play by center fielder Mike Trout in the bottom of the 1st inning of the annual Spring Training Freeway Series in Southern California. 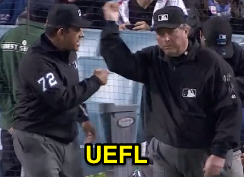 Both bookend replays turned against the boys in blue, as MLBAM HQ overturned Davis' ruling to award Trout with a double-saving effort, the two-minute review delay prompting broadcaster Victor Rojas to quip, "What are they looking at? It's ridiculous that it takes this long to overturn that call." A neighborhood play is overturned at second. In the top of the 7th inning, Anaheim (Los Angeles, formerly of Anaheim) again challenged a call up the middle, with Replay Review determining that Dodgers shortstop Gavin Lux failed to legally tag second base before throwing on to first. Fortunately, New York cut down on its review time for this non-neighborhood play, clocking in at 1:30. MLB in 2017 announced a two-minute guideline for its replay officials in New York, noting that the guideline is not a hardline rule nor limit. Baseball did not announce any substantive changes to its review process for the 2018 season.